Businesses in the retail industry are now using WiFi to enhance their customer experience and gather useful data about their customers. Though WiFi is a much sought-after service among shoppers, the key to providing a good and steady connection in a retail space and keep your customers happy is by controling the bandwidth consumed per user. Consider that for every customer in a store, you can count on them carrying at least one device with which they connect to the internet. 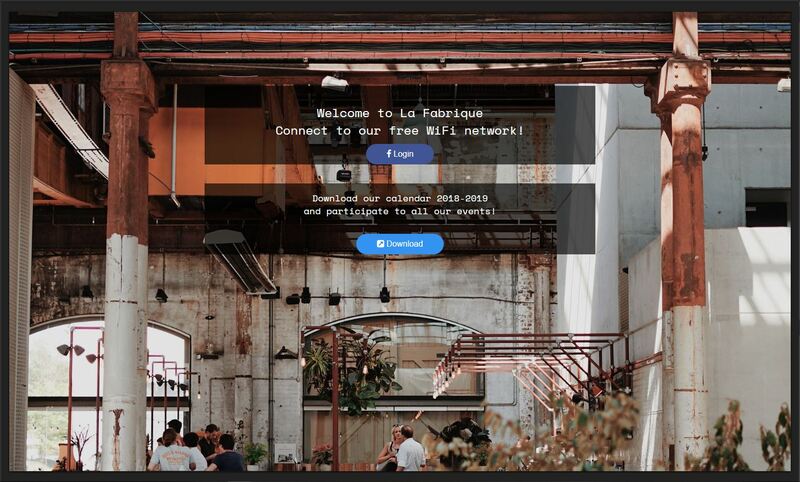 By offering a free WiFi connection, or a connection in exchange of information or a social action, businesses can offer a greater customer experience while also collecting large amounts of data. Seems like a win-win, right? However, it isn’t enough to simply offer a WiFi connection, the objective is to deploy a stable network at your store that can handle multiple concurrent sessions. Especially for those customers who are always connected, and do not wish to use their own data. To avoid offering a patchy, unreliable connection, it is best to start by managing your bandwidth. Though it can be difficult to determine the exact amount of bandwidth consumed by the users in your network, you can start by bearing in mind the types of internet applications are likely to use while at your location. These applications can range from low-bandwidth applications, such as instant messaging, to bandwidth hungry-applications, such as video streaming. The best approach is to find a bandwidth limit per client that enables customers to navigate their preferred applications while at your store, without interfering with the connection of the other concurrent users. Since we know, this is not an easy thing to do and locations that offer free WiFi often have to suffer faulty connections as a result of bandwidth hogs, Tanaza has developed a feature that allows you to evenly allocate bandwidth within your location for all concurrent users. 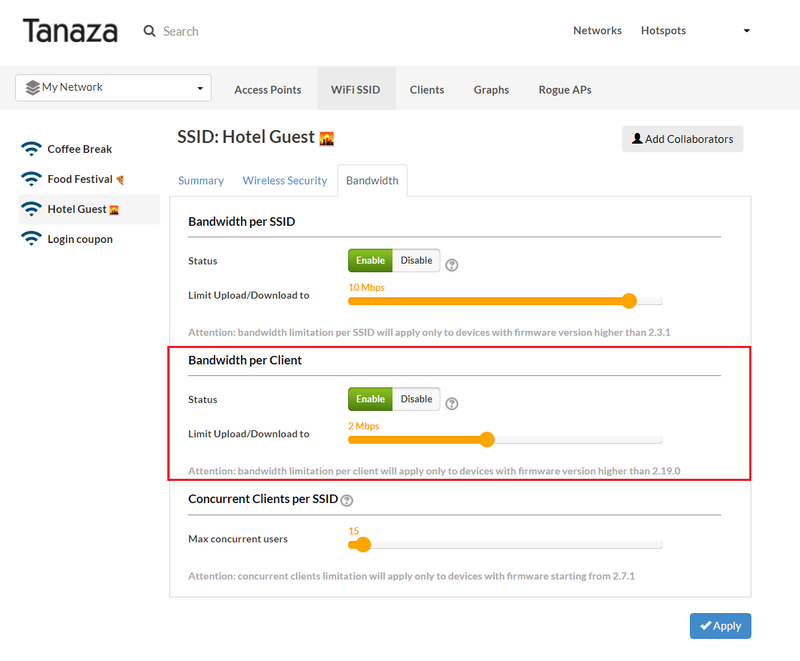 The recently released Bandwidth Control per Client feature, enables network administrators to set a per-user WiFi bandwidth limit. This feature is applied to all users at an SSID level and works on all types of SSIDs, whether users authenticate with a password (WEP, WPA2) or through a captive portal. The bandwidth per client set is the same for all users ​so that all users can benefit from the same WiFi performance. What’s more, in order to decide on the specific limit, you can use the data gathered on the Tanaza Dashboard to learn about your customer’s demographics and interests and thus decide on a bandwidth limit accordingly. One of the most useful functions of this feature is the “boost” function. With this function, users do not perceive that there is a limit on their bandwidth as it enables them temporarily go over the bandwidth limit. This is useful when your WiFi users stream music, buffer videos or video chat while they are connected to your network. For example, let’s say a network admin at a retail store configures an SSID for guest WiFi with a bandwidth limit of 4 Mbps. If the WiFi guest performs any online activity that consumes large amounts of bandwidth, i.e. streaming video, the guest can temporarily navigate the internet at a higher speed, consuming more bandwidth than other concurrent users, before the bandwidth limit is reapplied. Thanks to this function, WiFi users can navigate freely without being disconnected if they exceed their bandwidth limit. What makes this an essential feature for retail businesses that offer WiFi at their store is that it allows you to provide a parallel, ubiquitous connection to all the customers that connect to your network. A pleasant WiFi experience while shopping could also lead to customers wishing to stay longer at your store and wanting to return, customers sharing their personal contact information in order to receive promotional material, customer boosting your social presence due to an increase in the number of Likes and check-ins on your business’ Facebook page. Facebook recently announced restrictions on data usage by third party applications, including WiFi applications using Facebook Login. ​On 21st March 2018 Mark Zuckerberg shared a post about the Cambridge Analytica scandal (read it here). He reassured Facebook users’ about how their personal data are treated and, basically, took ​the blame for not protecting personal data as users would expect Facebook to do. At the same time, he announced some future “restrictions” on data usage by third-party applications, like the ones used by Tanaza and its partners to allow Facebook Login to WiFi networks. Unfortunately, the first restrictions were applied overnight without any previous communication to app developers. From our own analysis, Facebook now requests developers to provide https URLs in applications. An alert appears, informing users that they are not forced to activate this option immediately, but they might be in the future. Tanaza login applications for WiFi access to Facebook are perfectly working and no downtime has been registered on our systems due to the recent changes made by Facebook. However, some of our white label customers might experience issues or might receive alerts in relations to their login apps: we have already studied all the alerts shown in the Facebook Developers platform and described them in our article, with suggestions about what to do if you’re using Tanaza with Facebook login as a White Label Partner. Other changes might possibly happen in the next weeks, as announced by Zuckerberg himself. We’ll keep you posted during the next days and weeks in relation to any changes happening within the Facebook Developers platform that might affect your systems. For any questions, please drop an email to success@tanaza.com and we’ll get in touch as soon as possible.